Located in Chardon, Ohio, just a 40-minute drive west of Cleveland, Pioneer Waterland & Dry Fun Park is a 75-acre fun-for-all-ages water park where kids can dash under a mushroom waterfall or through the mouth of a pelican while parents keep a watchful eye from the comfort of a poolside tiki hut. Though attractions cater primarily to children, Pioneer Waterland & Dry Fun Park has a selection of adult appropriate attractions for both thrill-seekers and those who prefer to limit their adrenaline surges. Twin Bonzai Speedslides: These side-by-side six-story waterslides are a park favorite and get down to the business of thrills: straight to the bottom for maximum speed. The Spiral Slides: These twin waterslides (aptly named The Thriller and The Screamer) will have you twisting and turning down six stories of slippery fun. The Black Hole Enclosed Dark Slide: Amp up the excitement by crawling inside this six-story enclosed waterslide where you won't be able to tell where you're going next! The Lazy River: A must at any waterpark, the lazy river gives you the chance to float leisurely through the park on an inner tube. Swimming Pool: The pool is complete with beach volleyball and a new deep end, plus dinosaur and elephant slides for the little ones. Paddle Boats: If you're looking to relax, you and a friend can go for a paddle boat jaunt around the park's six-acre natural lake. Animal Slides: Your kids can have aquatic encounters with all walks from the animal kingdom on the turtle, frog and gorilla slides. Tiki Huts: Private poolside tiki huts can be rented from $40 per day. Kiddie Waterland: In this separate pool area, little ones can enjoy a pelican waterslide, a raindrop mushroom and waterspouts. Tot-land Play Area: This dry attraction geared towards the smallest visitors has ride-on toys, a crawl through tunnel and a playhouse. Golfing: Golfers of all kinds can find amusement at Pioneer Waterland, whether they prefer family fun at the 18-hole miniature golf Course or want to work on their accuracy and distance at the full driving range. 'Cannon' Shooting: Kids can beat the heat by facing off against friends in the water cannon war zone or opt for the air cannon shooting range if they prefer to stay dry. Basketball Course: Kids (or adults who are feeling particularly sporty) can work on their three-pointer or simply have a fun game with friends at the basketball court. Professional Batting Cages: Sports enthusiasts can do some spring training of their own at these batting cages. Fee required. Fun Zone Game Arcade: This new addition offers tons of great arcade games. Fee required. Grand Prix Go-Kart Supertrack: This quarter-mile track offers a thrill to riders with Formula K Racers. Single and double racers are available. Drivers must be at least 54 inches tall, but kids taller than 34 inches can ride with an adult. Rides cost $5 or can be purchased for $4 online. Pioneer Waterland & Dry Fun Park's regular season lasts from the end of May until Labor Day (weather permitting) but special events do take place beyond those dates, like the clam bake that draws a late September crowd out to enjoy special food and live entertainment. Regular park admission is $24 for adults, $12 for children ages three to 10, and free for children under three. There are several ways to get discounted tickets. If you are able to purchase tickets online, you can buy a day pass for $19 or half-price admission for any Monday during the regular season (to be purchased Tuesday through Sunday). Family passes and season passes are also available ($130 and $67 respectively). Family passes are valid for four family members and parking passes are available for $8. Group tickets can be purchased at a discounted rate of $16 per person. 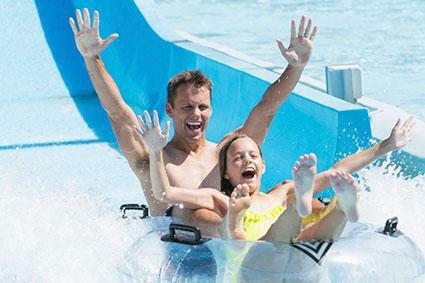 The water park is constantly running specials and discounts, like half price for dads on Fathers Days or half price for veterans and police/firefighters. You can call the park at 440-285-5200 or consult their social media pages for announcements about their frequent discounts and deals like Black Friday sales or Labor Day half-price admissions. At the on-site restaurant, Splash Landing Eatery, guests can enjoy a range of park favorites including hot dogs, corn dogs, chicken fingers, personal pizza, mozzarella sticks, soft pretzels, nachos, subs, salads, funnel cakes and more. There are also value combos and a range of refreshing drinks to wash it all down, like lemonade, soda, slushies, smoothies and hot drinks. While this tempting selection is available, you are also permitted to bring in your own food and beverage (with the exception of alcoholic beverages). There are grills located around the picnic ares (you are not allowed to bring your own) if you want to dress up some burgers and have a family meal to round out your day. Just make sure to bring your own charcoal and barbecue lighter. This popular family park changed ownership in July 2014 and has since turned its ear to the public for advice on the park's facilities, resulting in constant repairs and upgrades, including a new website in April 2015. In the 2015 season alone they added new landscaping, facility updates like new murals, and a wide selection of arcade games. The park's social media accounts are a great place to keep up with the changes, as they often take into consideration feedback given on their Facebook and Twitter accounts and use these platforms to announce the changes (like when they opened a deep end in the pool for the 2015 season). They've also begun posting photos to a relatively new Instagram account. When asked about their favorite park attractions on the company's Facebook page, visitors' answers varied from the speed slides to the lazy river (though the speed slides seemed to come out a winner). Customers seem particularly satisfied with the variety of attractions that can be accessed with the park admission (though there are a few things you may be tempted to pay more for). They also love the park policy that you are allowed to bring in your own food and drink (a true rarity in any amusement park). There have been many positive reviews regarding the value of the changes made under new management, and one thing remains clear: kids seem consistently thrilled with the place. One Yelp reviewer who brought his camp kids for a day trip said one enthusiastically called it "the best place ever". Make sure to keep up-to-date on what's in store for the next season and try to snag one of the park's upcoming deals. Consult their Facebook page or Twitter feed for notifications about special events, exclusive deals, or cancellations based on inclement weather.